- Polaris is coming out with a new version of their system, called LEAP, which will provide a web-based staff interface. This means that we will be able to work with Polaris in staff mode from any computer with an internet connection. The first functions to be available will be patron services, including checkout and holds. Eventually, all of the current staff functions will be possible through LEAP. The user interface looks very well designed - simple, intuitive, and efficient - a big improvement on the current staff client software. The current client will continue to be developed and supported, although I assume that eventually it will be replaced by LEAP or something like it. This was confirmed by statements from Innovative Interfaces after they purchased the Polaris company in spring 2014. We decided that we could not afford to buy LEAP at present - we will wait and see how it develops. - Polaris will be integrating Overdrive functions into the catalog, so that customers can see availability of ebooks and e-audiobooks, place holds, and check them out right from the PAC, without having to go to a separate Md. Digital Library website. - Lots of useful features are coming in an upgrade in 2014, including allowing a renewal for an item with a hold, if there's another item that could fill it available; hold notices can be processed multiple times per day, not just once overnight; we can send a second hold pickup notice if the item isn't picked up; we can protect a bib record from ever being overlaid, and automatically delete certain MARC tags on importing bib records; we will be able to do an ad hoc bulk change from any window with a list of items. The great advantage of the PUG conference is its narrow focus - everybody uses the same software and has the same issues or questions. I will definitely be attending in the future! 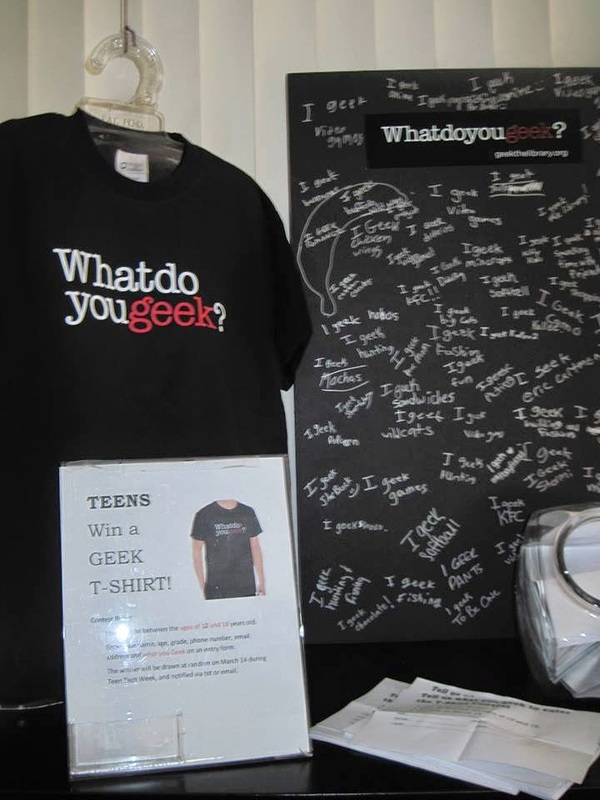 MLA/DLA 2014 - What do you geek? So what do you geek? Being a "geek" I initially thought that this session would be a techy talk about some cool new technology, but this was is a little different because it wasn't so much about being a "geek", it's more about what you're passionate about. It's turning your passion into support from the community. ‘Geek the Library’ is a community-based public awareness campaign designed to highlight the vital role of public libraries in today’s challenging environment and raise awareness about the critical funding issues public libraries face. Whatever you geek, serious or fun, the public library supports you. Hancock War Memorial Branch Manager Marilyn Pontious is the ONLY Maryland public library participating in the 'Geek The Library' campaign. She found out about the campaign during her trip to the Association for Rural & Small Libraries (ARSL) Conference in 2013. Teen at Hancok writing what she "geeks"
Marilyn signed up to join the campaign and received great response from her community. She put up a blackboard provided by the campaign and got great responses especially from the teens in Hancock. It became a conversation piece and it was simply a way of finding out what her patrons were passion about and it became a way to engage the community about the importance of libraries. The community participated by writing out what they "geeked" on the board seen here and below. The 'Geek The Library' campaign provided most of the gear from t-shirts, bags and bumper stickers. They provide much of the marketing material for free! Marilyn said that the only expense that she had was purchasing a banner that was less than $50. I thought that it was a great way to promote libraries at virtually no added cost to the library other than a commitment of time. The 'Geek The Library' campaign is a great way for libraries to start conversations with their communities about why the library is important. It's still not too late to join the campaign, sign-up continues until June 30, 2014. Find out more information here. The campaign is sponsored by OCLC, a nonprofit library cooperative that has provided services to help libraries deliver more to their users for four decades. Supported by a grant from the Bill & Melinda Gates Foundation, OCLC partnered with Chicago-based marketing communications agency Leo Burnett USA to create the campaign. The 'Geek The Library' campaign is a great way to start a conversation in your community about the importance of libraries. Initially it engages the community to share what they are passionate about, but it because an avenue to share with the community why libraries are important and even get funding if needed. 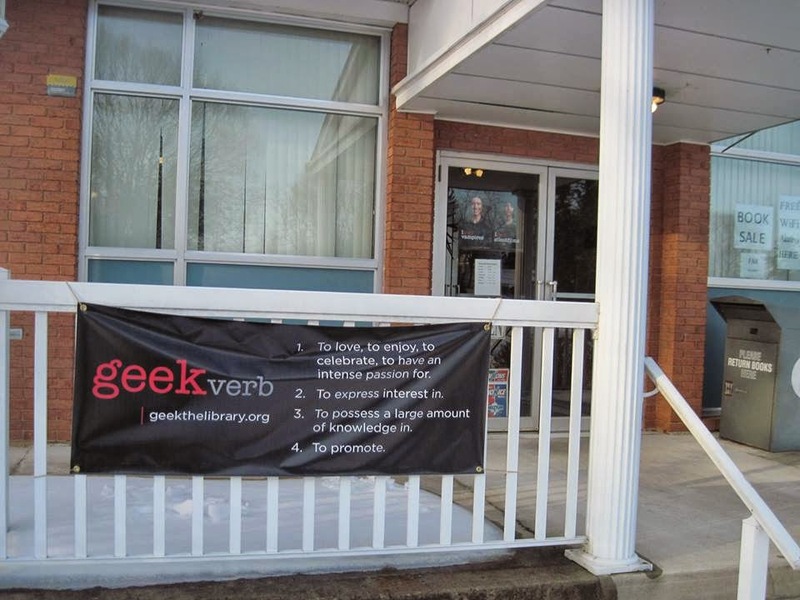 The 'Geek The Library' campaign sign-up runs until June 30, 2014, so it's not too late to sign up! Talk to your administrator and see if you can sign up your library today! I had the privilege of attending several educational seminars over this past year, and I gained helpful knowledge and insight from all of them. I am very thankful for WMRL's continued support of these opportunities for our staff here at Ruth Enlow Library. In September 2013, I attended a webinar in Oakland titled Dealing with Difficult Patrons. We watched Dr. Steve Albrecht demonstrate how to deal with problem patrons in an effective manner and in a way that is minimally disruptive to the other library patrons. I especially appreciated the emphasis on the need for proper enforcement of the Library Codes of Conduct to help avoid escalating situations, as well as the communication tools that he gave us for helping to calm an angry or unstable person in the library. My only criticism of this presentation was that the slide presentation was not very engaging or interactive. In November 2013, I attended the annual MD Statewide Circulation Conference in Prince George's County. I was able to see the brand new library there, which was really enjoyable. It is always interesting to visit other libraries to see how they arrange their collections and displays. We enjoyed a delightful presentation on "Books & Butterflies: an ecologist looks at libraries as an ecosystem" by Dr. Leslie Ries in which she compared various facets of the environmental ecosystems to the functions of the library. I also attended a workshop entitled "Let's talk circulation" where we collectively discussed various topics of interest that affect libraries and how to handle situations that can arise in every library (people talking loudly, homeless patrons, computer usage rules, overdue fines, etc.) This was especially helpful as a variety of people shared innovative ideas for dealing with these situations. My last workshop there was titled, "A Step Above: what it means to be an effective supervisor" lead by Moniek Frasier. This was by far my favorite and most helpful session at this conference. She was an engaging speaker with years of supervisory experience, and she provided many helpful hints on being an excellent supervisor in an informative, interactive fashion. I have implemented a few of her ideas, including acknowledging years of service for my staff in some special way along with notes to articulate how vital they are to our workplace. Also in November 2013, I attended the annual WMRL Summit in Frostburg. As always, the interaction with our neighboring county libraries was enjoyable and helpful. I participated in the Yoga session on stretching, which I found extremely useful for long days at a computer desk. The Disaster Preparedness seminar was disappointing; it was not dealing with the aspect of library security that I had thought it would, and I didn't find the information very practical or helpful for me in the library setting. Maurice Coleman's presentation of online resources was very informative and enjoyable (he is always a great presenter!!). Finally, in March 2014, I attended a day-long seminar on Mental Health First Aid. The presenters did a very good job of giving us the tools we need to assist people who have special needs. The booklet we received is a great resource, as well as the 211 phone number that we discovered is available to people all over the state who are needing special assistance in a variety of areas. It did seem like the information could have been condensed into a half-day seminar, as much of it was repetitive for the various scenarios which were presented. But it was still an overall worthwhile educational opportunity. LATI was an intense, five-month-long roller coaster ride of webinars; homework; driving to and from Baltimore; giving presentations; group work; diving into social networking sites, websites, and data bases; exploration of reference books and children’s areas; more ways to Google than ever imagined; how to tell types of books by their covers; and so on. In short, a little bit of All Things Library. I still have my huge notebook, neatly divided into weeks, sitting near my desk. Since graduating, I’ve referred to it now and then, though not as often as I’d like. When I graduated, I was so far behind in my regular job duties, that I haven’t had time to review sections as I’d intended. BUT, I know what Tumblr is and how it can be used by libraries. I helped a patron find current physics journal articles, send them to his e-mail, and download them on his tablet. I now use Goodreads and a range of book award sites for selecting titles for my branch. I’m now aware of the professional organizations for librarians and how they can help with networking, information, and legal assistance. I have a much better understanding about the political vagaries and financial belt-tightening involved in keeping libraries running, and the importance of libraries in upholding the freedom of speech and fair access to information. I’d say it was very worthwhile, and Gail Griffith, the coordinator, was exceptional. This was a very interesting workshop about how to deal with patrons who are depressed, anxious, using drugs, or having a psychotic episode. (Note: Don’t threaten patrons by telling them you’re going to call the police. Instead, have a signal with fellow employees that means: Go out of earshot and call the police.) Basically, with any of these conditions, you should try to appear calm. Ask the patron if this has ever happened before, and if so, how did he or she deal with it. Try to get a hold of a family member. Ascertain if the person has gone off of a medication. Comply with reasonable requests. They may have something they do to calm themselves down, like pacing back and forth. Be aware that they might be hearing voices that you can’t hear, telling them conflicting things; perhaps the person keeps glancing over his or her shoulder toward this voice. Treat these as real people, like the person does. Encourage them to get professional help, which they can find by calling 211, which is also a suicide prevention line. The action plan is: A- Assess for risk of harm to self or others. L- Listen nonjudgmentally G- Give reassurance and information, and E- Encourage appropriate self-help, professional help, and support strategies. Meanwhile, if you feel the person is a threat to anyone, call 911. On June 2 I attended the 'Talk to the Hand' training given by WMRL and presented by Julie Gaver. This training was given to the entire Allegany County Library staff and helped me to identify the different types of difficult patrons we have to deal with on a daily basis. Before the session, Julie was given a list of what we here in the county had identified as our most challenging situations. We all have to deal with patrons who give us problems, and it was interesting to see that all the branches in the system seem to have similar issues. Julie focused on these issues and led us through discussions about why it is important to enforce policies. We learned that the two extremes of authority figures are the enforcer and the pushover. We should aim for something between the two extremes so the atmosphere in the library is pleasant for everyone. Julie then broke us into groups and had us discuss four types of problem patrons. We wrote down our observations and each group shared what they came up with. Finally, Julie gave us scenarios that actually occur in the library setting, and had us role play how to handle the situations. It was interesting to see how the other branches handled the troublemakers. Julie also gave us tips on what to do when we find ourselves in these situations. Later, at the branch, I had several opportunities to put what I learned into practice! This training will help with my everyday library life. It will also help the system if everybody is taught how to deal with trouble makers and there will be consistency throughout the county. On Sept. 27, 2013, I attended the Broadband Summit held at Frostburg State University. The purpose of the summit was to let Internet Service Providers and Garrett County and Allegany County businesses and county organizations discuss broadband internet access in the area. Local politicians from both counties were also in attendance. Several businesses want broadband but are located in remote areas where it is not available. They desire to have the service and asked why providers did not have plans to run lines into their areas. The providers maintain that there is not a business case that justifies the expense of building the lines to remote areas: there are not enough customers. Sorry to be such a neglectful blogger. Many thanks to WMRL for supporting our learning activities throughout the year! The webinar covered employee family leave requests and notice requirements, employee medical certifications; when and how often to request new certification and re-certifications; dealing with medical providers legal information requests; and FMLA leave recordkeeping. The webinar had a large audience which made it hard to interact with the presenter when we had questions. The webinar was held in the afternoon and we had the usual slow connection problems. I learned a lot about the newer record-keeping requirements. Developing a Staff Competency Program That Works! The programs were too numerous to review individually. As a group they were almost overwhelming in a two day period. The conference left me with a range of great ideas to try, but some of the content seemed stale. I learned that passive programming is a thing. A thing that we have been doing all along without realizing we were doing it. I learned new strategies for effectively informing patrons of the library’s rules. I also attended the MLA/DLA conference in May 2014. I felt that the workshop on Dealing with Mental Illness was especially useful. We were given information on the new Common Core and how they could relate to library services. Jon Lewis presented his tips on using music in storyimes. Tess Goldwasser tried to convince us that playing the ukulele would be fun and easy to learn. Author Kevin Sherry gave an entertaining talk on creating his book I'm the Biggest Thing in the Ocean. Katherine Lyons spoke of discovering the hidden math in books. Phyllis Bontrager and Michele Presley shared some of the apps they use in storyimes. I purchased the Mr. Jon & Friends cd from Mr. Lewis and use something from it in most every storytime. I tried to learn to play the ukulele, not so much luck there. 1. There is a natural connection between dance/movement and science. This workshop was not what I expected but I certainly came way from it with some ideas to use in programming. The material is aimed more at a classroom setting but I think I can adapt some of the ideas for my preschool story-time. I also think it gave me some good ideas for this year's summer reading program. No website for this event specifically but www.autismspeaks.org is a valuable resource. 1 in 88 individuals in Maryland have some kind of autism spectrum disorder (2012 and parents of autistic children spend more money on health care and therapies than parents of children in any other disability group. The core deficit of autism is the inability of the person with autism to empathize. To know one child with autism is to know one child - you can't generalize. How does what I learned apply to me and to libraries in general? The statistics tell me that there are children in my service community with autism. I know one child personally but he is very high functioning. What I learned at this workshop was that I need to be more aware, especially when dealing with individuals who use my branch. Because my community is small, at the moment there is no need to offer programming specifically for individuals with autism, but that may change in the future. With the increase of this disorder, libraries in general need to welcome and help to facilitate community inclusion of these persons. Pat Wishard and I attended a seminar at the Kent County Library System offering suggestions on new programming that could be considered for our library system. The presenter was from Pennsylvania and represented a system that was much larger than that of Washington County. Though the system was larger, it faced the same challenges as we face in programming: Getting the community engaged, keeping programming interesting and varied, and reaching the community with marketing. Several fundraising programs were outlined. Then the presenter explained what publicity worked with the programs, and which just didn't quite hit the mark and why. The presenter was quite enthusiastic, positive, and informative. While there we met other library system representatives that were involved in Gala events. They were very interested in talking to us about our experiences in producing Galas as their premier event was scheduled for January, 2014. If this seminar was offered again, I would like to attend. Gail Griffith lead this workshop series that introduced library staff at all levels to the power of shifting our mental models in order to help our libraries move ahead more nimbly in a rapidly changing world. We worked with mental models that can be used to transform library programs and services, including customer service. Throughout the day, we co-created ideas for transformative services that can help build advocates in our communities. The foundation for the workshop was Peter Senge's, The Fifth Discipline: The Art and Practice of the Learning Organization. Senge's vision of a learning organization is a group of people who are continually enhancing their capabilities to create results they care about. Personal Mastery - the development of a set of skills through learning and practice. Mental Models - deeply ingrained assumptions, generalizations, or even pictures/images that influence how we understand the world and how we take action. Shared Vision - if any one idea about leadership has inspired organizations for thousands of years, it's the capacity to hold a shared picture of the future we seek to create. Systems Thinking - this discipline integrates the other four. Pam Sandlian Smith's TEDx Talk about What to Expect from Libraries in the 21st Century. New York Public Library's video that hopes to change the public's mental models about the transformative power of public libraries. Direct people to non-Internet dependent events already happening at the library like storytimes for kids or movie-screenings or speakers. Partner with other community organizations who might still have Internet and then direct folks to them. As part of the workshop, we were asked to participate in a post-project that involves posting to a wiki out ideas for how we can identify and bust more mental models. The final session I attended was Music in Storytime by Jon Lewis who talked about action songs to use on CD's in Storytimes. Some of his suggestions were Hokey Pokey by Buck Howdy on Giddyup CD, All Around the Kitchen by Dan Zanes on Family Dance CD, Moon, Moon, Moon by Laurie Berkner on Victor Vito CD, Brush Your Teeth by Raffi on Singable Songs Collection CD and the songs on his own CD, Mr. Jon and Friends. He suggested watching YouTube videos of some of these songs. The music session was my favorite session of the day and I purchased Mr. Jon and Friends because it had the cutest song entitled Matilda the Gorilla on it. I planned a gorilla story time just so I could use this song. He has other cute songs on his CD also. So if you are interested in this CD just borrow it from the Smithsburg Library. · There are definitive connections between movement and the process of scientific inquiry. · Children learn on many different levels when you combine their scientific, analytical, creative, and kinesthetic sides. This provides unique challenges which heightens their creativity and critical thinking. · When you allow children to express themselves freely, through movement, inquiry, etc., you are letting them think for themselves, beyond the norm or expectation. This workshop was eye-opening and full of great ways to incorporate movement and the process of scientific inquiry in children's programming. Gaining a better understanding of the connections between these two topics has inspired me to include more movement and STEM activities and higher order (critical thinking) questions in my story times. I am able to more successfully plan both STEM and regular story times so that they are more beneficial to the children I am serving. Also, things that I learned have been particularly helpful in planning my science-themed story times for our Summer Reading Club: Fizz, Boom, Read!